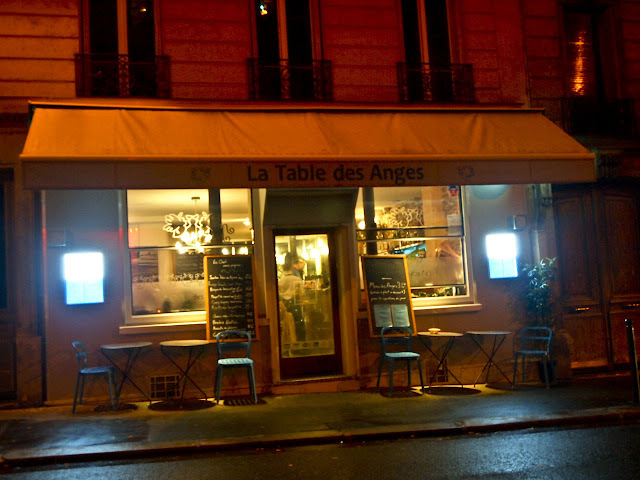 Last night in Paris, and we were hoping for a great meal with end the trip with a bang. Trouble was, we'd left it until pretty late in the evening, and so decided an amble down Rue des Martyrs might turn up something. First impressions weren't too promising though, as most of the shops were shut. Just as we were about to give up and get a kebab from one of the many kebabs shops on Boulevard Clichy, we spotted a welcoming glow from La Table des Anges. Upon entering, we were greeted with a hearty 'Bonsoir!' and asked if we had a reservation. The place was heaving, and for a moment I thought we might have to resume our search for food. Fotunately, the friendly waiter asked us to wait, and in a couple of minutes, we were ushered to a little table between two large, boisterous groups. So, you're probably used to getting complimentary baskets of bread from restaurants. Well, this place went one better, and presented us with free ham! I don't even know even words to express how awesome that is, especially when it's freshly shaved, paper-thin, fluffy and just the right amount of salty. I didn't think to ask what kind of jambon it was, but there was a whole hunk of it in the corner of the restaurant, sitting on top of an industrial-looking meat-shaver machine (I don't actually know what those machines are called?). We didn't have to wait to long for our starters to arrive. 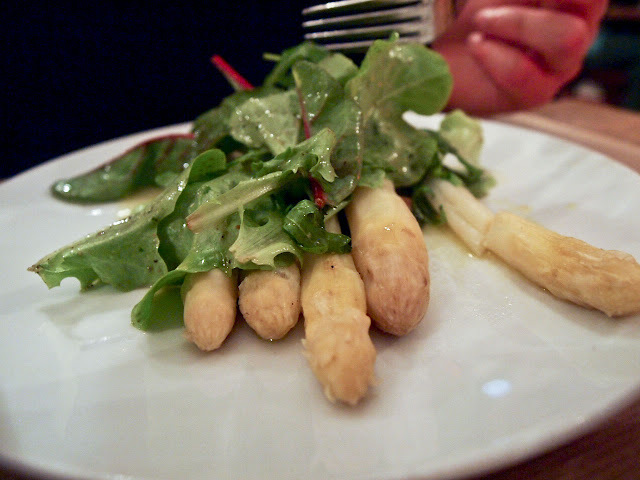 Manbacon's white asparagus was simply steamed, and topped with a fresh salad. The creamy-yellow spears were buttery soft, and a far cry from the limp disappointments you get in those supermarket tins. A great example of 'less is more' when it comes to good, fresh produce. My lobster bisque was surprisingly large - that bowl in the picture was as big as my face, and filled to the brim. In some poncy restaurants that would have been a rather pricey main course. Anyway, not a bad thing, since I was starving. 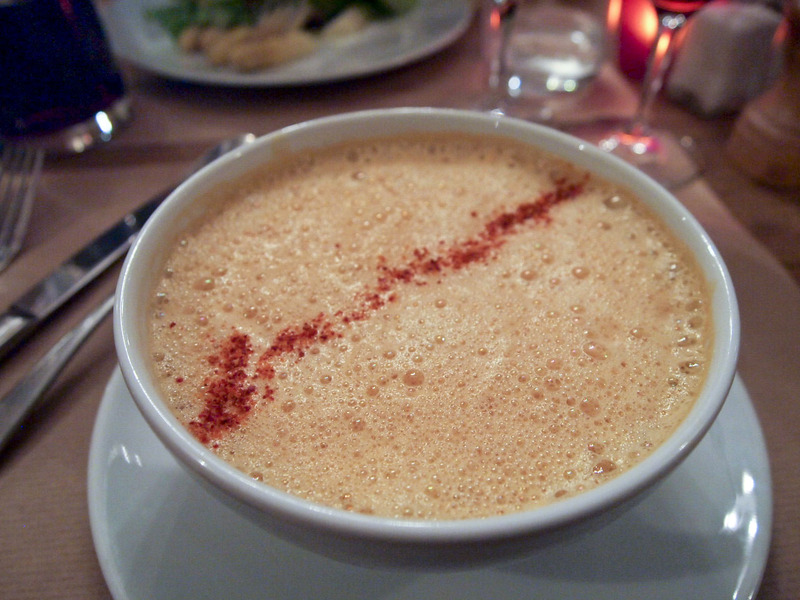 The soup itself had a velvety texture, accompanied by a lovely marine taste from the shellfish. Like eating sea velvet. And then, of course, a generous parcel of ravioli at the bottom, plump and covered in a beautifully thin, almost translucent dough. I took my time with the soup so I could savour the taste as long as possible. Alas, it wasn't a bottomless bowl of soup, so I eventually finished it rather than have it go cold. Because we'd had such a good experience with duck the night before, we both decided to chance it and ordered the duck again. The friendly waiter had asked how we wanted our duck cooked, to which we both replied 'pink'. Because overcooked duck is a culinary sin. If last night's dish was good, this was mindblowing! 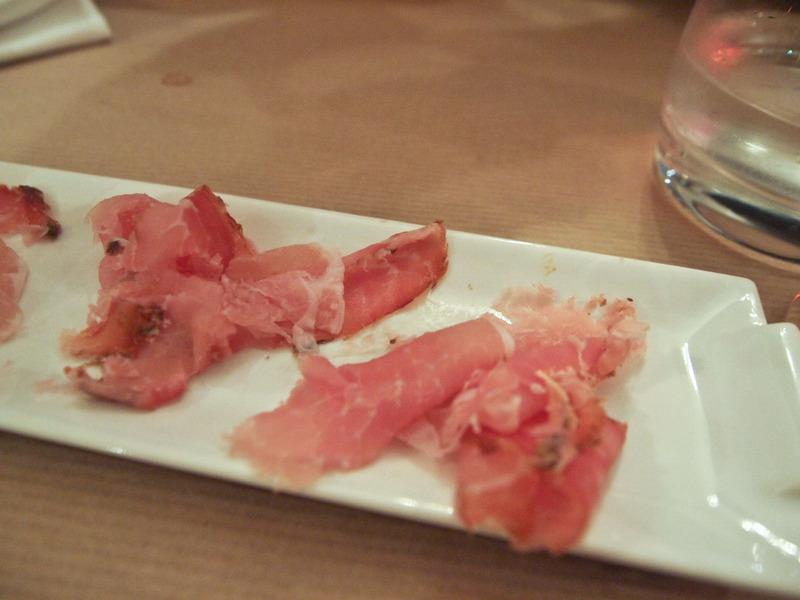 It came perfectly pink and juicy, with lightly seared skin and a (un)healthy layer of fat inbetween. 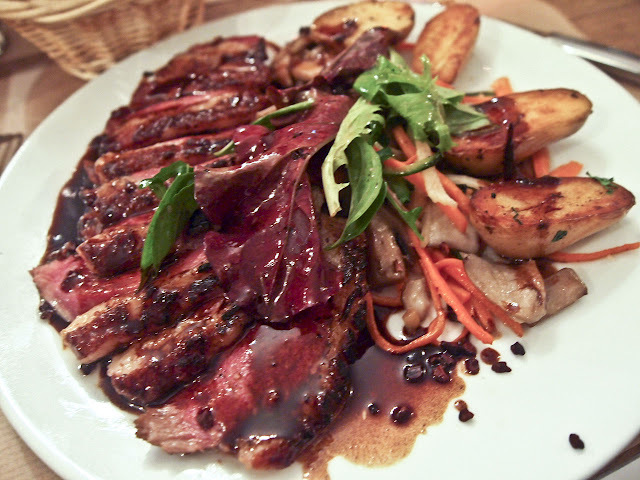 Perfectly cooked duck like this is the reason I find it impossible for me to go vego. The dish came with a light, warm salad of shredded courgettes, carrots and mushrooms, which reminded me of those shredded salads you get in banh mi and Vietnamese noodle dishes. The only bit I didn't enjoy were the potatoes - just a bit too dry, and nowhere as fantastic as the dauphinoise I enjoyed the night before.